Non-Cochlear Projections to the Ventral Cochlear Nucleus: Are they Mainly Inhibitory? Non-cochlear synapses in the ventral cochlear nucleus (VCN), originate from a variety of intrinsic and extrinsic sources. It has been suggested by some studies that these synapses may actually outnumber those of the primary afferents in some regions of the VCN. 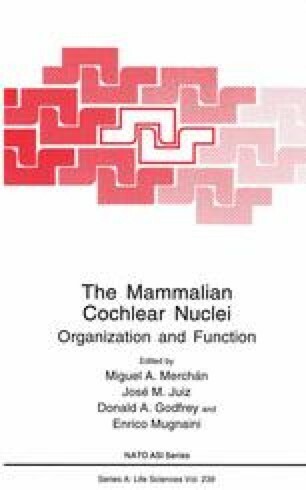 In this chapter we will review the evidence that most non-cochlear synapses may be inhibitory, examine their distribution on different cell types in the VCN, and attempt to identify their origins.